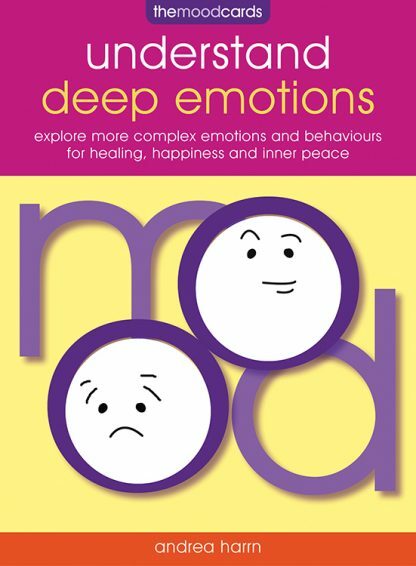 Based on mindfulness, cognitive behavioral therapy, and positive psychology, this pack demystifies psychology and mental-health labels and offers a fun and accessible way to help you identify and explore moods, feelings, and emotions. Following the success of the original bestselling Mood Cards, this new, stand-alone volume offers 50 cards to help you work with more complex emotions and behaviors, so that you can embark on a deeper journey of self-discovery. Learn more about your issues and obstacles, how you operate in relationships and work situation, and gain new insights and perspectives that will help you achieve success and a healthy work/life balance. Each card includes guided questions for self-exploration plus an affirmation for positive thinking, and the pack is suitable for personal and professional use alike. Andrea Harrn, MA is a psychotherapist, hypnotherapist, intuitive healer, expert in mindfulness and cognitive behavioral therapy, and the author of the bestseller The Mood Cards. She runs a successful practice in East London, where her work combines Eastern philosophy with Western science and has helped hundreds of people find truth, clarity, balance, meaning, acceptance, love, and happiness in their lives.